Humans not getting along is as old as history. And, humans learning to form bonds is also just as old. We are social creatures after all. So, as our kids grow and start entering social situations (like at daycare), it’s important that early childhood educators help kids get along and feel included. At home, this can be something for families and siblings to work on. But in daycare and preschool settings, the dynamic is a little different, and requires special procedures. Below, we’ll cover ways that a preschool or daycare teacher can create environments of inclusion and friendship. Learning to respond appropriately when your feelings get hurt, and learning how to treat others as you want to be treated are learned skills. They need to be taught to daycare and preschool-age kids regularly. Remember, they’re new at making friends. They’ve just come from being babies, where everything was about them; they got everything they wanted, when they wanted it, and no one ever questioned their importance. Now, they’re at daycare or preschool, and they’re learning to cope with the fact that they are not the centre of attention. Even if they come from homes with siblings, it can take a bit of time to get used to the idea of how to treat kids their age. The early childhood educator plays an important role in emphasizing classroom rules of appropriate behaviour. These may need to go up on a chart, or spoken about frequently (not just when something bad happens). Then, it needs “follow-through.” In other words, the rules need to be enforced (gently, of course!). One important part of teaching kids about conflict resolution is helping them form empathy. Sometimes, this means helping kids describe their own feelings. That way, when they may treat others badly, and hear how it made others feel, a lesson may resonate within them. They may realize that since they don’t like feeling those negative feelings, they shouldn’t cause them on others either. There are many words to describe our emotions in the English language. And these can have small discrepancies. It may seem obvious to you what your feelings are. But to these early-aged children, putting a name to them is obscure. They may cry when they’re sad, and also when they’re angry, or even when they’re tired or jealous. So which one is it? It’s important for them to know which is which. Use language they can understand at their age, as well as role play and examples to educate children on feelings for empathy. This can make a good subject for circle time in the morning, before the day starts. As this article states, kids need to have friends. Even if they seem to like playing alone, no one wants to feel left out, or disliked. Friendships in preschool and daycare are critical. But, since the kids are new to the skill of friendship-building and group dynamics, they need a little encouragement and help. As the early childhood educator in the classroom, you can do a lot by pairing your pupils into duos for a task, or forming larger groups that change often. Let them learn to form bonds, by giving them a task they need to do together. If, in your capacity as caregiver in the classroom, you notice one child is isolated from the others, it’s also your duty to find out what’s wrong, and to help him or her feel included. They may shy away from what the kids are doing now. But you can find an activity that one child likes, and then slowly bring in others to join the fun. For example, maybe the shy child likes playdough. So you can start by being their play partner. Then, ask if Johnny or Melissa wants to come in and do that too. But keep watch: you may need to facilitate the kids talking to each other, instead of the shy one feeling like they’ve just had a takeover of their game. It goes without saying, that when we say it’s important to do things together, that also means YOU as the adult in the room. The children should feel safe and warm in your care. They shouldn’t feel afraid to go to school, or for their parents to leave. If they can trust you, it’s more likely they will trust who you’re asking them to be friends with! On this note, it is especially important for early childhood educators to embrace diversity. For example, if the child is not yet speaking English (remember, they’ve just come out of their home-only environment and into the ‘real world’), you can pick up some of their language to start. But language is only one form of diversity. Learning disabilities, culture, gender and socio-economic backgrounds are also points of diversity (among others). An early childhood educator needs to be attuned to the varied needs of the children in their care. Sometimes, it can make all the difference to go the extra mile for a child who is feeling ‘different.’ Bringing out differences as strengths in the classroom is one way you can facilitate inclusion (hey why not have a multicultural lesson series?). Not to mention, showing each individual child you are interested in what makes them unique! 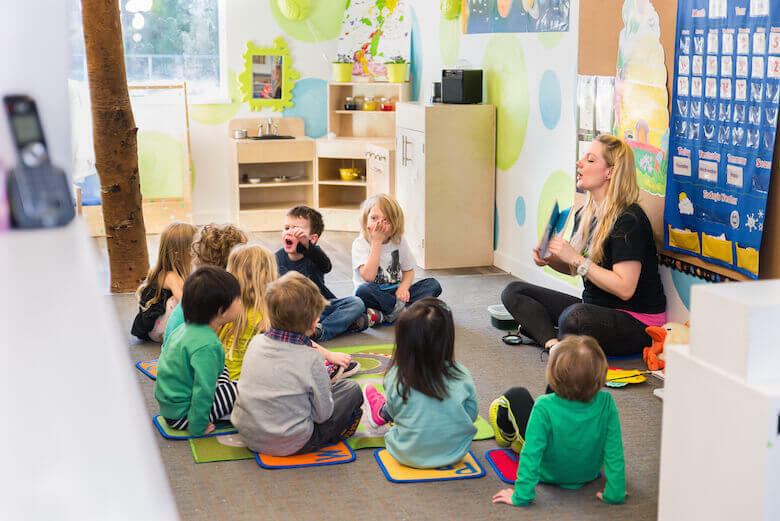 As we’ve seen, establishing an environment of inclusion starts with the teacher of a preschool or daycare classroom. It’s important to teach the rules regularly so that kids learn the skill of friendship-building. In addition, you can create a ‘team’ environment by encouraging the kids to do group activities together. Free play and ‘sit and listen’ times are ok, as is solitary play. But it’s important to add partnership and team effort to the mix, to give the kids a chance to form bonds. Finally, remember that the feeling of inclusion starts with you: the way you receive a child, show an effort to get to know them, and embrace their diversity all play a part in how they feel in the classroom. Once they admire you, it can be easier to get them to admire each other.